↑ "USATF – 2006 Competition Rules". USA Track & Field. Retrieved 29 October 2006. ↑ 100 Metres – men – senior – outdoor. iaaf.org. Retrieved on 20 April 2013. ↑ Pedroso may lose record. The Victoria Advocate (4 August 1995). ↑ Athlete profile for Iván Pedroso. 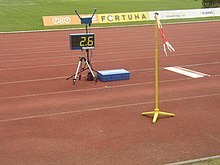 Iaaf.org (17 December 1972). Retrieved on 2013-04-20.